Ever experience something that took your breath away? It’s truly an in-the-moment experience…whether it be a negative or positive experience. When this happens, we’re usually doing something else, probably unaware of what’s going on around us, when all of a sudden something happens to bring our attention front and center, in the moment, that makes us take in a big gasp of air in a state of shock. Had we been present in that moment, we would have been consciously breathing. And that regardless of what happened, we would have remained calm and present, without needing to gasp for air…knowing full well the next step to take…if any. This month’s mandala reminds us to consciously breathe, to be aware of our breath, taking it in and letting it out, bringing us back into the present moment. For it is only here where we can truly experience life, only here where we can affect any change, only here where we can express love, peace, and joy…regardless of the events around us. 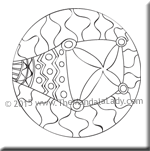 Ponder this (and breathe) as we color this month’s mandala.